A Paris-based start-up, Gecko Biomedical has shown in animal testing that its adhesive can be elastic enough to hold heart tissue, despite the heart pumping at 180 beats per minute. If you want to put a glue to the extreme test, the pumping heart would be the most challenging spot. A Paris-based start-up, Gecko Biomedical, working with technology developed at the Massachusetts Institute of Technology (MIT), has shown in animal testing that its adhesive can be elastic enough to hold heart tissue, despite the heart pumping at 180 beats per minute. The glue uses molecules which already exist in the body and is activated by ultraviolet light. Trials are on in Europe. The company wants to go commercial in 2016, targeting the tissue repair market and later the minimally invasive surgery market where it has many advantages over stitches and sutures. In 2005, Jeffrey Karp, a post-doc researcher at MIT, took a bio-inspired approach to create sticky material which could seal soft tissue and work under wet conditions. 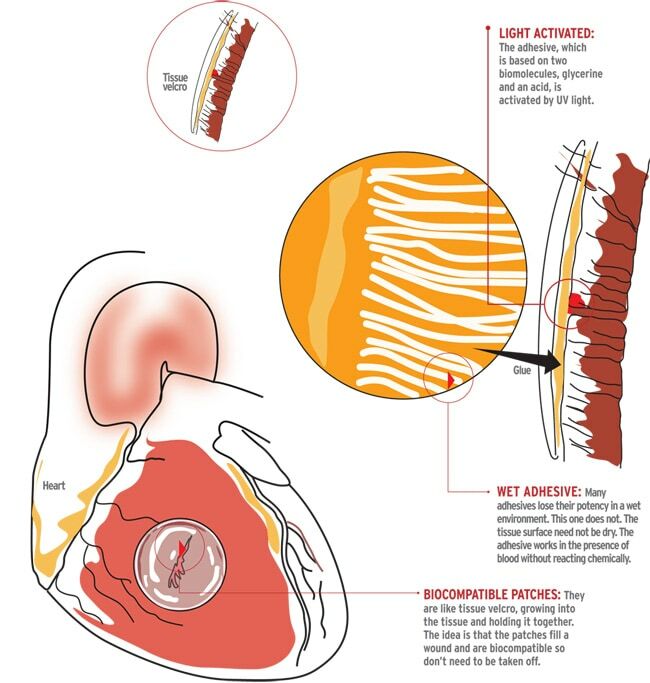 In 2009, Pedro del Nido, a doctor at the Boston Children's Hospital, came to him with a specific problem: how to seal the holes between chambers of the heart - a congenital problem some children have. Sutures could tear the fragile tissue while implants, designed for adults and non-biodegradable, often required invasive surgery. After four years of work, the duo found the solution. Turning to nature for inspiration can get you out of conventional thinking. Karp was at the right place. He had worked at the Langer Lab, probably the most prolific biomaterials lab in the world, named after Robert Langer. Bernard Gilly, a serial entrepreneur who sold his biotech company for 370 million euros to Sanofi in 2009, was looking to set up a medical ecosystem in Paris. He came to Boston and Karp's work caught his eye. The company started a year ago and also has Langer as a co-founder. If it can work in the heart, it should work with any other organ too. Karp has also developed adhesive platforms inspired by porcupine quills, sandcastle worms and spiders. The current design includes adhesives in the form of a gel that can seal tissue as well as patches. The base material is glycerine and sebacic acid. A key property is that the adhesive does not react chemically with blood. Instead, when a UV light shines on it, a molecule called a photoinitiator triggers the linking action of the polymer chains which cause adhesion. The glue hardens when you want it to. The patches are like Band-Aid. Karp describes them as tissue velcro. If there is a hole to be filled, the patch can work as a scaffold for cell infiltration. The patch is also biodegradable and doesn't need to be taken off. An estimated two million heart surgeries are needed every year in India. This technology may eventually reduce the cost of heart surgery and related surgical procedures. While the company's priority is Europe, Christophe Bancel, CEO at Gecko Biomedical, says India will be an important market to consider when the time comes.